"Mashed delicata squash that is so yummy you'll think you were eating mashed sweet potatoes!" Place squash in a large saucepan with enough water to cover. Bring to a boil, and cook 10 minutes or until tender. Drain, and cool slightly. When cool enough, remove the skin. Transfer squash to a medium bowl. Mix in the honey, dark brown sugar, cinnamon, and allspice. Mash together thoroughly, and serve warm. 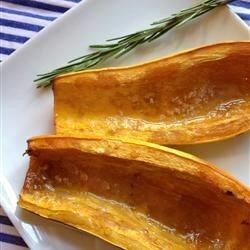 Delicata squash is our favorite squash. This recipe is similiar to the way I prepare it. I usually cook my squah in the microwave after poking holes in it with a fork. Quick and easy. Great taste and easy to prepare. I microwaved this to save time, water and nutrients.